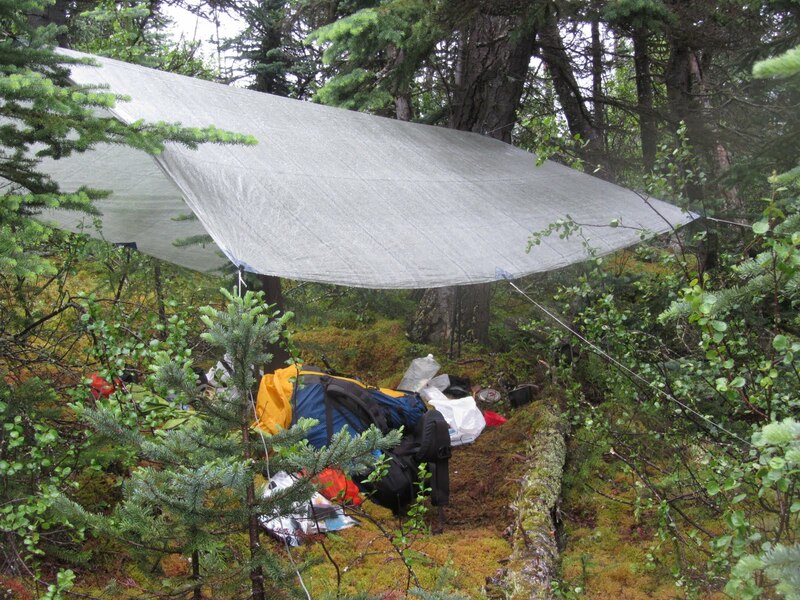 Being a lightweight operator turned out to be more difficult than I had expected on the Nahanni trip. The pack I had brought was too small by far. So I had to buy a new pack in Calgary in a rush a couple of hours before the plane for Whitehorse took off. I shopped around for a Golite pack, but they seemed to be pretty unknown in the stores I phoned. Noone knew of any retailer selling Golite. So I went to Mountain Equipment Coop and bought their lightest big pack. 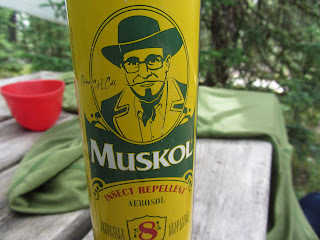 2,2 kilos for their 85 litre Alpinelite was not too bad, and the price 139 CAD, was not bad neither. I could have done worse. So what did I put into this, by my standards, huge bag? As can be seen on the photo above, most of the 85 liters were put to use at the begining of the hike in to the source of the Nahanni. I did not have any suitable scale around, so the exakt weight will forever be shrouded in mystery. But I think I can make an educated guess by going through what was in it. Roughly, I started out with my ordinary three season gear. 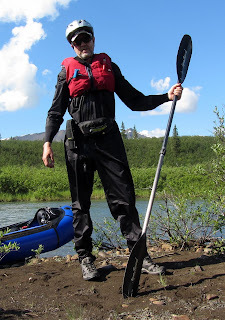 You can see a complete list here, from my Virihaure walk last year that also included a packraft, but with less ambitious equipment in connection with the raft. The baseweight excluding packrafting gear and food/consumables for the Virihaure trip was slightly more than 6 kilos (13 lbs). 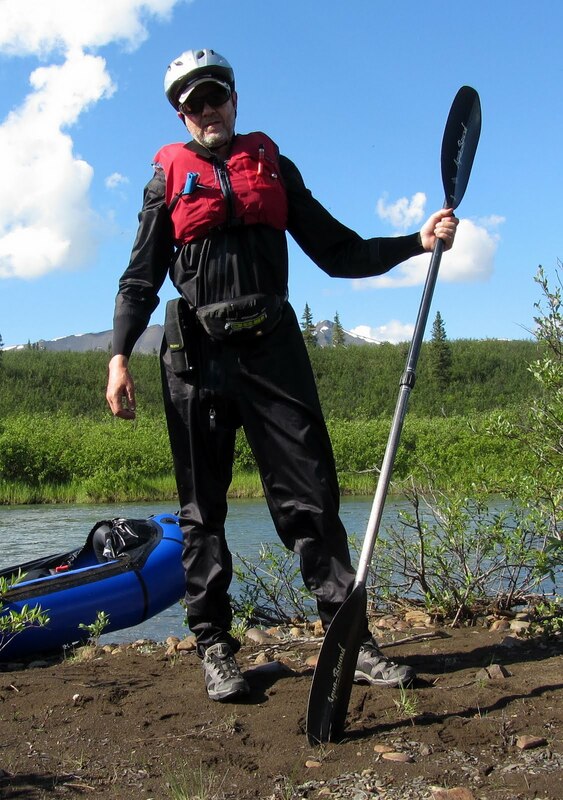 The baseweight for the Nahanni excluding packrafting gear and food was roughly 8,7 kilos (19 lbs). So what made up the difference of some 2,5-2,7 kilos? Well, the big culprit was, as usual, one of the three big; the pack. At 2, 2 kilos (5 lbs) it was about 1,5 kilos (3 lbs) heavier than the GG Mariposa Plus used at Virihaure or any other pack I have used for the last decade. The second biggest culprits were my two Ursacks. These Kevlar bags and corresponding rope weighed 450 grams combined and held food for 10 days when I started out. Careful packing could probably have stretched this to 12-14 days. 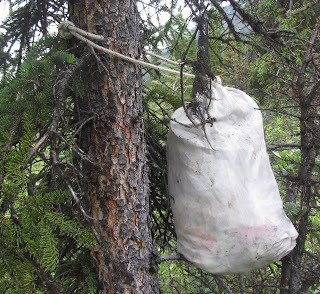 I choose the Ursacks to protect my food from bears and rodents since hanging food is at best a tedious option with the scrawny spruce encountered on the first part of the trip. My bear spray including holster tipped the scale at 365 grams. I could have put this as 'worn' and thus not influencing pack base weight, but I felt that this could have obscured the weight of this item for readers of my lists even if it was in fact 'worn' at all times. My 2,6x3 meters homemade tarp of cuben fibre, including six pieces of 2 meter cord weighed 220 grams. Worth every single one. So pack, bearbags, bearspray and tarp explain about 2,5 kilos (5,5 lbs) of the extra weight I was carrying compared to the Virihaure trip. Which basically explains almost everything, the rest being a few odds and ends like extra medication (antibiotics etc), a GPS Spot messenger, extra batteries for that plus solar charger. 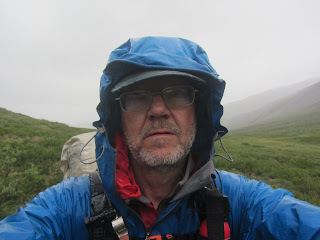 On the plus side there was a lighter camera on the Nahanni trip than on the Virihaure one and a pair of Marmot Essence rain pants that stayed at home. And perhaps shouldn't, but that is another story. The above sums up to about 5,8 kilos (13 lbs). 5,8 kilos is really not much for gear that brought me safely through rocks and gardens for 550 kilometers of Canadian wilderness river, but it still had to be carried and added to the load. Last but not least: Food and other consumables. Other consumables are usually almost only fuel. Of course if you want to be picky you can add sunscreen and mosquito repellent and what not, but that would in most instances account for less than 100 grams anyway, even on a long trip like this. In the scramble to get a big enough pack in Calgary and still make the fligth to Whitehorse I lost my bar of mosquito repellent. Not so good, although I had a headnet to save my sanity. I asked just about everybody along the way from Whitehorse and up the Canol Rd and lucked out about one hour before leaving the gravel road and taking to the bush. OK, consumable a k a fuel. It was an easy decision to pick a wood burning stove for this trip. There would be absolutely no shortage of fuel with all the driftwood I was likely to encounter along the Nahanni. So I used a Bush Buddy Ultra for all cooking. It worked very well. 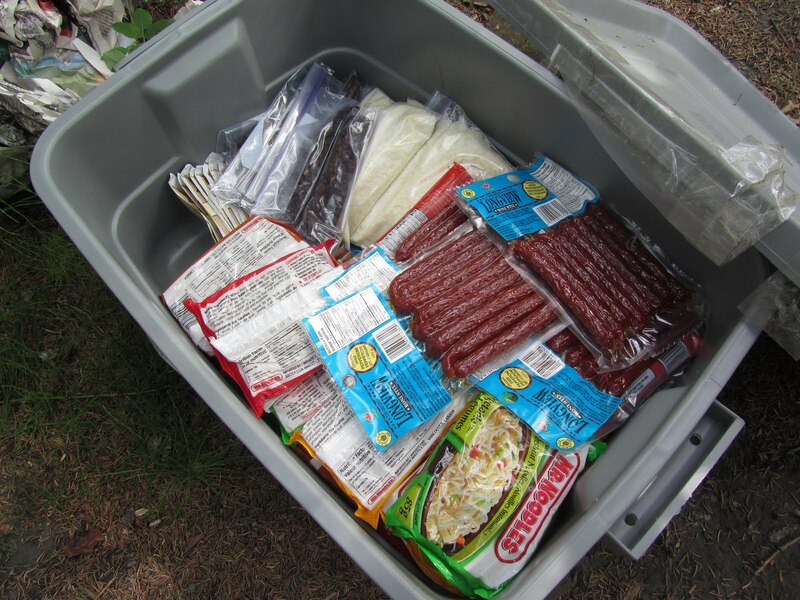 When I started the hike I had brought food for 10 days in my pack. This weighed approximately 9 kilos (19 lbs). A box with 8 days of food waited in Rabbitkettle, but by then I was floating and could have brought quite a bit more and heavier food. Bit of a mistake from my part not to think of that. Summing it up: Starting off from N Canol Rd my pack would have weighed 8,7 + 5,8 + 9 = 23,5 kilos (52 lbs). If I could have managed to find a Golite Quest in Calgary, which would have saved me 800 grams. 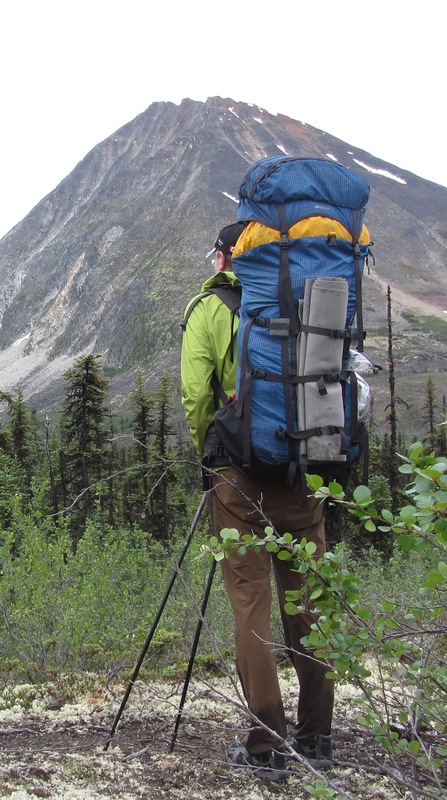 According to the excellent article by Chris Townsend at BPL on light packs for heavy loads this is a pack that can handle up to 25 kilos without folding. With the exception of the pack, my tree big ones were pretty light: GG The One tent at 490 grams, a Marmot Hydrogen sleeping bag at 686 grams and sleeping pads Neoair Short and an MLD Good Night EVA 1/8 totalling 400 grams. If I had found the Quest I would just about have made 343 or three kilos for the three big ones. Now it was more like 3,8 kilos for the three big ones. Nice article. 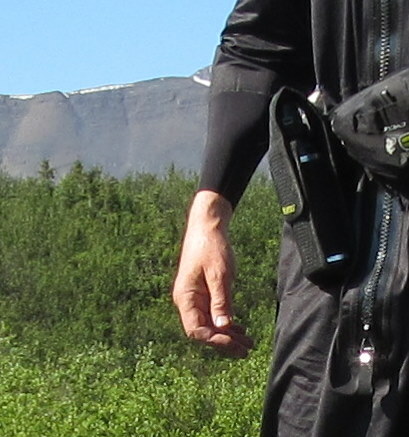 You still managed to go lighter than I did for my 8 day packrafting trip even though I carried a Golite Pinnacle (which was quite uncomfortable in the beginning). The differences are easily seen and I think I will adjust my system a bit for the future. Thanks for ideas. Hos much did you carry in the Pinnacle from the start and when did it become comfortable? The real pack weight in the beginning was a bit higher because of some extra fresh food for the first evening and morning (we first planned to camp on the road side but then opted for walking 15km during the first night). It might have been nearly 25kg. After 10km or so it started to be somewhat uncomfortable.A Ridgerest rolled inside as a virtual frame might have helped but I doubt. On the second day (or first as the first stretch was walked during night) we covered about 30km and the last 10km or so was uncomfortable for several reason, the heavy rucksack being one. If I'd have to walk more frequently with loads over 15-17kg I'd get a heavier rucksack for more comfort despite the weight. Nice gear review. I think i have to sew a cuben tarp..
How did you find the MEC pack by the way ? It sure looks like good value and normally MEC makes good quality gear. Looks like an amazing trip the country up there is beautiful. I've carried 13-14 kilos in a Golite Jam and am amazed that a 'stay-free' pack can perform as well. However, for loads exceeding that I prefer for instance ULA Ohm or GG Mariposa, which both have stays. In those I have carried around 17 kilos without problems. My son carried around 25 kilos on the Ohm this summer and said it was allright. I have always suspected that if you really fill a Pinnacle the load would be on the heavy side for the construction. Your experiences seem to support this theory. On the other hand the likes of Andrew Skurka seem to like it. The pack was certainly all right. I left it in Canada since I was over the weight limit for the flight anyway and could not really imagine any use for it. But I would consider it very good value for your money for a big conventional but reasonably light pack. OK, I did not know that Golite did not sell in Canada. A bit surprising. I like the big volume of Pinnacle because I can fit my full lenght Ridgerest in the pack, and the Pinnacle will also see some winter use with bulky sleeping bags and down jackets ( = lots of volume but not that much weight). From my limited experience the Pinnacle is closest to the "one rucksack to rule them all" for me. Though I shold try e.g. ULA packs (I really like the concept of the Epic pack). Useful post Jörgen, it is interesting to note that you were still able to keep your load weight down as I suspect that many others would have started with a much larger base weight. I feel that perhaps having a slightly heavier pack than desired may have made the load carrying a little better especially at the beginning of the trip. 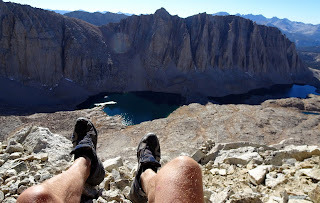 I always feel I am caught between the lightest possible pack and the "best carrier for the load" when I set off on a big trip, there is always a balancing act. Cuben tarp sewing is also on my agenda. Actually, after having written the blog entry I felt more satisfied than before. The baseweight was low, ten years ago I would have carried 12 kilos more (basew approx 18 kilos...). Of course, a real he-man should carry 35 kilos on a Canadian wilderness trip, so I do not qualify. The pack was at its heaviest when I carried it, nothing to do about that. And it carried well, but according to Chris T a lighter bag would have done the trick as well. I should have been able to shave 0,5-0,8 kilos perhaps. But my experience is that ultralight packs can carry loads in comfort way heavier than the manufacturers claim. A cuben tar that is rectangular is very easy to make. You tape the centre/ridge seam and then just fold it a couple of times around the perimeter and sew it. Some heavier fabric as anchors for the loops and Bob's your uncle. Hi, well a month ago i walked 3 days in northern Vermland, Sweden. Or maybe better i was almost swimming all the time. Jörgen I had the same Salomon shoes on as you use. Good in the water, but I had problems with my GoLite Breech, yes the backpack GoLite made When they still were on good terms with Ray Jardine... All my stuff did fit well in the backpack including food for 4 days. But it carried not really comfortable, which I already noticed before on other tours with such a load. On Daytours no problem. When I got home I took my old FjällRäven Gyro frame pack and plunged all the stuff I had with me in it. Then took it on my back, wow much more comfortable! The frame pack weights maybe 2kg but can take much more abuse and weight. Since I do not want to buy a new bigger lightweight backpack the Fjällräven pack will be my choice for the next time. greeting from Fred. I wonder what Go-Lite is up to.. Not for sale in Canada. A couple of years ago in Holland one could buy some Go-Lite items. Then suddenly Go-Lite was not available anymore. The importer and Go-Lite had a kind of a Mini war what I understood. Don't know now if Go-Lite is back on the scene in Holland, I do live now in Sweden. In Sweden it seems also difficult to buy Go-Lite. I bought the (probably) last Shangri-La 2 at Get Out. They told me they had problems with getting new items from Go-Lite. So what policy has Go-Lite? Greetings Jörgen,and yes I enjoyed your stories! Great stories Jörgen! I have been inspired to cut my pack weight a great deal and still havent spent much money on it which is great. The biggest saving was using five fingers or vivo barefoot ultra rather than boots. Im not using a tent (vindskydd), the only thing I bought is a backpack. I have been experimenting with wood gas stoves, could you eloborate on the bush buddy, what did you use to cut the wood? Did you bring a saw? I find it hard to brake sticks to that short length. How did your UL clothes handle an open flame and sparks? By the way I use an IKEA utensil "basket" for a fire basket and it is a good compromise between a woodgas stove and a normal open fire. I did not bring saw or axe and my sheath knife was lost during one of my swims (still had a small Swiss Army knife).For the Bushbuddy I only picked dry twigs of about finger thickness. They were fairly easy to break into short pieces and feed into the Bush buddy. However, doing this continously for days and weeks puts a lot of wear on your fingers and hands, if you like me are a desk jockey. Sometimes I used my neopren gloves to protect particulary the outside of my right index finger, which took most of the beating. A number of years ago I used a Sierra zip stove (double wall with a fan)and on some hikes I did in fact bring a pair of light pruning shears (secateur)for cutting the twigs. I found that I needed some sort of firestarter for the Bushbuddy in order to get it started reasonably fast. I had brought some pieces of birch bark from Sweden but ran out and instead used scraps of paper from chocolate bar wrappings etc that I soaked with Muskol before igniting. After that it was easy to add a number of small dry twigs and then you were in business and could start shoveling in the bigger twigs. I am told the IKEA utensil stand works pretty well as a fire basket, however it does not have double walls like the Bushbuddy and others, which I find makes it significantly easier to use once you get the fire started. I used a Nimblewill nomad stove for a long hike some years ago and could not make it work very well except when circumstances were benign. However, all this comes down to practice making perfect and how much time you want to invest in learning the skill. Personally I prefer gas canister stoves, since I usually (not in bear country)often cook in my tent. I did not really get any sparks that damaged any clothing. I have seldom found that UL clothing is more sensitive than non-UL clothing in this aspect. If you are unlucky you will get a small hole in your clothing and the difference between really thin synthetics and ordinary synthetics is too small to outweigh other disadvantages. IMHO, anyway. A small hole in a piece of clothing is no big deal. If it is rain gear you just put some duct tape on it, but a small hole will not normally 'leak' very much. Of course it depends a bit on where on the garment the hole is and how severe a rain storm you encounter, but worst case scenarios are not really the most common occurences. + Accepts longer and thicker sticks making it easier to find and break wood. + Cheap (you can use any can and make plenty of holes in it). For ease of use a gas canister stove is of course outstanding. Another thing one can consider in order to save weight is pemmican. The weight is about half (for the same energy) compared to freeze dried (frystorkat) and you dont even have to cook it on the trail. Just eat it as is. It will be a significant weightsaver for longer trips. I will test to use it as my only food for a weekend to start with. If the Indians could I should be able to do it as well! By the way it is tasty, believe it or not. I made pemmican myself many, many years ago. It certainly packs a punch. Do you buy yours or make it yourself? I make it myself. As a shortcut I have used ghee or clarified butter which is easier to "make" compared to making tallow. However it does have a lower melting point (I think below roundabout 24 C is ok) but on the other hand it is easier on tastebuds not accustomed to the taste. I use some salt and pepper on the meat as well but no berries so far. For variation one can make a soup, just put the pemmican in boiling water and you get a tasty soup. I really dont like the candy they call energybars so I made my own based on the ideas of pemmican (dried substance absorbing fat). I melted butter, pure cocoa and some coconut oil and added very finely grinded (in food processor) nuts until the fat was saturated with nuts. I also added a little dried fruit and a little bit of honey and salt. The problem was that they are so tasty it will be hard not to eat them at home before I hit the trails. Another note if anyone is going to try pemmican, make sure you get used to low carbohydrate intake before going out, there will be roundabout a week when your body is craving sugar but then it starts running on ketogens and creates bloodsugar from the fat and protein. On pemmican: Interesting mixture with nuts. The stuff I made was very traditional, I was living in Canada at the time. Dried/jerked beed was shredded to powder in a food processor and mixed with melted tallow (only the clear substance). I put too much fat into it, so it stayed a bit softish. However, it might be worth trying again. This is of course more of a source of protein than your mixture, but still with a lot of calories. I do not like power bars and the likes neither, I find the ones I have tried too sickeningly sweet. "This is of course more of a source of protein than your mixture, but still with a lot of calories." I dont understand this comment. I make "real" pemmican with either tallow or ghee and shredded dry meat. The mixture should be 50/50 weight according to my recipe. This gives a good source of protein and fat. The second section of my comment discusses another thing that came as an idea after I had made pemmican, that is the nut version. Which is more of a candy/energy bar based on nut fruits and fat. OK, misunderstanding. What I meant was that pemmican consisting of nuts (which are mostly fat)and tallow/ghee is mostly fat. Which is good from an energy perspective. Replacing the nuts with meat means that the fat/energy content will be lower and the protein/essential aminoacid content will be higher. Ok no worries! Let us know if you experiment further with pemmican and the nutversion. I would have given you the recipe (nutversion) if I could but I just did it on feeling. When I do it again I can weigh the ingredients, that way we can get a proper calorie count per/gram as well and those not willing to experiment can have a proper recipe! Could you tell how much weight did you lose on this trip? On weight loss: Good question. The last time I was on a three week hike, a couple of years ago, I walked about 500 kilometers and did not loose one pound. 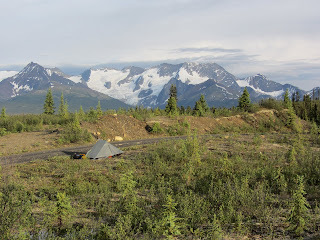 I brought the same amount of food on the Nahanni trip and lost 2-3 kilos (about 5 lbs). 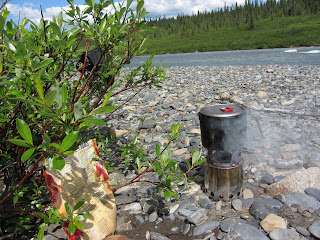 However, on the Nahanni I did not eat all my food. While walking I ate the assigned calories, but I was not as hungry during the river part of the trip. I figured this was pretty natural, since paddling was not as hard work as hiking. So I only ate the chocolate I brought as snacks, but not the hazelnuts nor the raisins. Obviously I should have eaten everything, even if I did not feel the need. From my personal experience there is a certain maximum amount of fat that the stomach can take. It seems to be relative (usually expressed as % of total energy from food) as well as absolute (total grams of fat per day). Depending on the source the max relative amount seems to vary between 50-80% with the absolute amount being about the same around 300-350g of pure fat per day. From this point of view I wouldn't plan the diet of a physically demanding hike solely on pemmican because both the relative and the absolute amount of fat would be too high in my opinion (based on personal experiences from a 3-week Svalbard trip and experiences from a lot longer Finnish arctic expeditions). And based on observing other on ketogen diet (max. 20g of carbohydrates per day) the diet doesn't seem to be especially good for physically demanding life, e.g. hiking. But pemmican would be a great addition to a summer hiking diet: lots of fat and decent amount of protein which often are missing... But for counting solely on pemmican, I would like to do a test run (one week hike or so) and of course change the diet well before a longer trip (maybe 2-4 weeks). I just tested pemmican on a long one day hike (almost 43 km with 7 kilos) and it went great! My companion ate "normal" food and was in significantly better shape then me but he actually had some problem keeping up with me! BUT I am used to eating less carbs than most and I would say you need more than 2-4 weeks to perform well with pemmican but it varies from person to person. Next test will be for a few more days but since I´m already eating a ketogenic "diet" most of the time and exercising so I dont think it will be a problem. My plan for this long walk was to eat some dried fruit but I didnt. There is a misconception that you cant perform on a ketogenic diet but it is not true and especially on all day exercises you can really benefit from being used to "burn" fat. Funny that you mention the stomach problem with fat! My first reason to eat a ketogenic diet was a troublesome stomach (I read that 90% of people with IBS got better on a low carb diet and it worked for me as well :-)). I guess what you can eat and not depends a lot on what you are used to and how you prepare. Low carb high fat diets are a bit of arage now and I have several friends that swear by it. It will be interesting to see how thngs develop with your pemmican tests. Just a note on a simplification I did: Instead of rendering tallow (cow fat) or clarifying butter I just used pure butter. It wont last as long as the other options but it will last long enough for most and if you keep it cool it will last very long. It is easier to eat (takes less getting used to) compared to tallow in my opinion. Good luck if you try it out and if you dont want to go ketogenic. Sorry for posting again. "last" is probably the wrong word I mean that butter pemmican will go bad sooner compared to the other options.